This “Saturdate”, my wife and I hit up a local asparagus festival (no pictures, sorry) and power-washed the house (no pictures, you’re welcome). We hoped to get some time outdoors as a family on Sunday, however. My daughter likes to think she wants to go canoeing with us. She oohs and aahs over pictures my wife and I have taken, and says it sounds like fun, plus there can be fishing involved! But every time we try to press the issue, there’s a good excuse. Wary of bringing a squirming six year-old who would rather not be there aboard a canoe, we have yet to make a firm stand. So it was that this Sunday morning, as the sun warmed the morning air, I left alone for some peace and quiet on the river, though the night before the plan had been for all three of us to explore the river together. Alas, maybe next time. 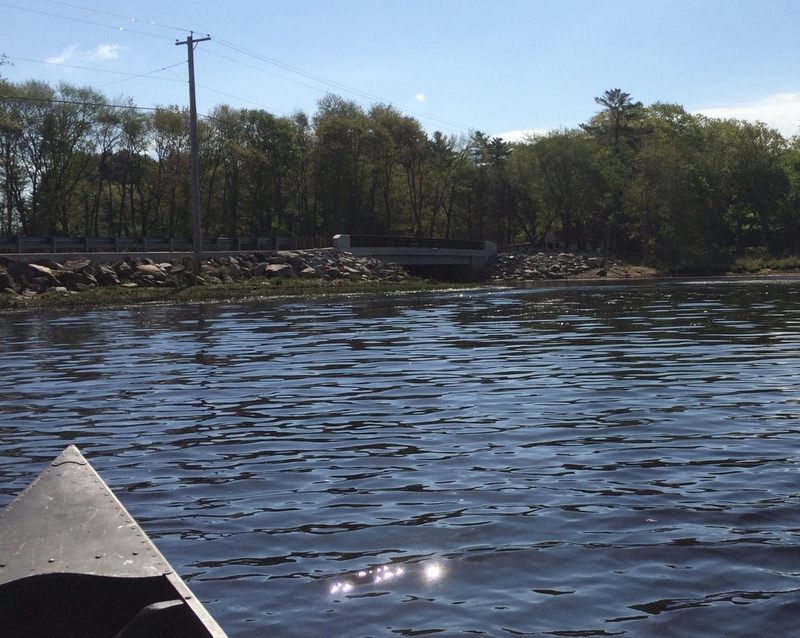 As before, I put in at the sandy shore of Quaboag Pond, and paddled along the shoreline towards the bridge. There was a bit of a breeze and the water was lower than last time, but I managed to navigate around the shallowest area and go under the bridge. Around and under the bridge (but not pictured here) is a fair amount of litter from irresponsible fishermen. It frustrates and annoys me to see those who supposedly are enjoying nature’s bounty treat it so poorly. When I see an entire case’s worth of beer cans scattered around the rocks and dead fish left decaying on the sand, I want to apologize for those of us who don’t understand how lucky we are to have this here. 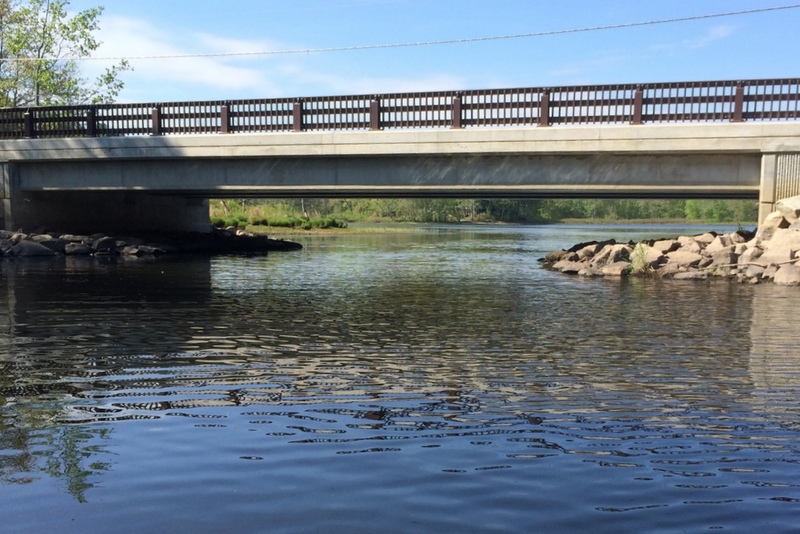 With the bridge behind me, I began paddling upriver towards East Brookfield and Spencer. I didn’t know how far I was going to go, but my plan was to paddle until I was tired of it, and make a relaxing return trip home. The spring colors were very much in view (see above, with bonus beaver den) all around. 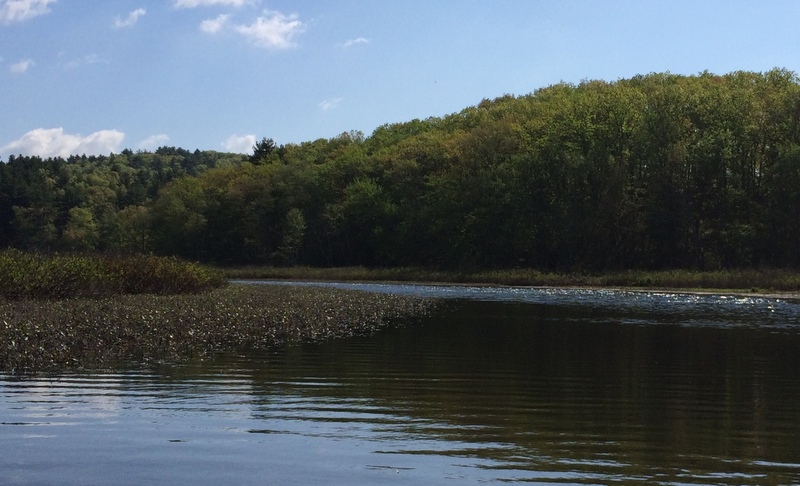 Birds sang out in all directions, mallards flew overhead, red-winged blackbirds darted from shore to shore, and a few great blue herons kept flying upriver just ahead of me. Turtles quietly slipped from rocks and branches into the water as I approached. It was incredibly peaceful; I didn’t even assemble my fishing rod the entire trip upriver. The river twists often, providing an ever-changing view. In some areas the water is faster and shallower, in some it is deep and quiet. At a few spots it was possible to pull off into a side pool and relax, but in general I had to be vigilant about keeping the canoe pointed upstream. As you see above, pausing to take a picture usually meant the canoe would begin to twist and I’d be soon facing back the way I had come. Here I’m capturing photos as the boat goes from pointing upstream to pointing at the shoreline, on its way to a 180-degree turn. This helped me get much more comfortable with controlling the boat, though. Many of the pictures look similar but I covered about a mile of river here from the bridge, upstream. It occurs to me that the times I felt most confident stopping to photograph were near bends like this. It was hard to capture images of wildlife with the phone camera. I passed many birds, as I said; here I managed to get a small snapshot of a blackbird near a beaver den. But there were many more images I didn’t have time to capture. Shortly after the beaver den, the water began to get shallower, and by necessity faster-moving. I snapped these shots mainly to show the depth of the water (or lack thereof); the entire river has parts like this but there is usually a deeper channel. At this point, I had trouble finding such a channel, and the entire time searching for one was complicated by the current. After fighting a few moments, I gave up,and decided to begin heading back. On the trip back, I resolved to take it slow. 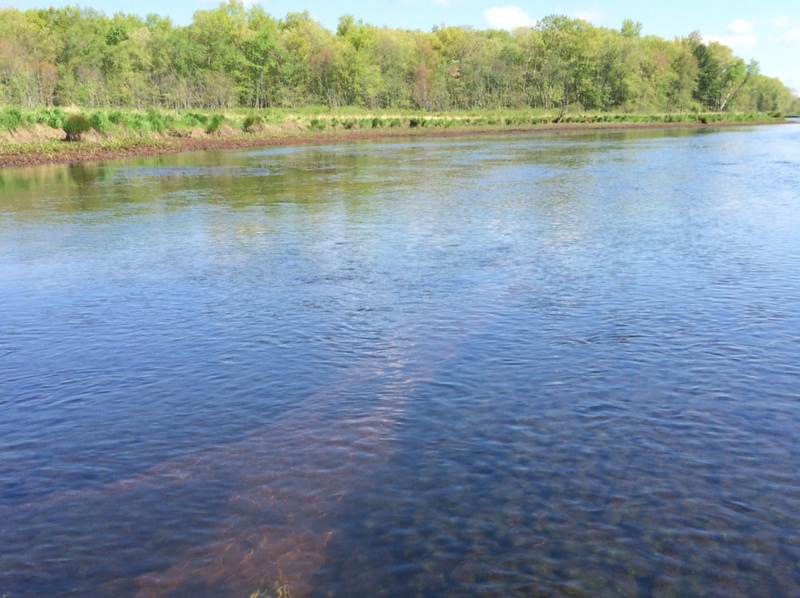 I let the current drift me all over the river, and I fished periodically (catching a midsized pickerel and a modest perch for my trouble). I took fewer pictures (and the ones I did take seemed plagued by focus issues, so none made this post). While my trip upriver had been silent and solitary, on the return I passed several kayakers. I also encountered either an otter (we’ve seen otters here before) or a beaver; some swimming mammal with a mouth full of vegetation was startled by a kayaker and dove underwater not more than 20 feet from me. I wish I had been just a bit closer to be sure what I was seeing. The closer I got to the pond, the more I realized my little solitary jaunt was coming to an end. It was sad but satisfying; my arms were tired and I wasn’t looking forward to lifting that canoe back onto the truck. But I made my way back under the bridge and fought the stronger breeze on the pond to reach the shoreline again. There, 5 more people were launching kayaks – seems I started my trip just in time. 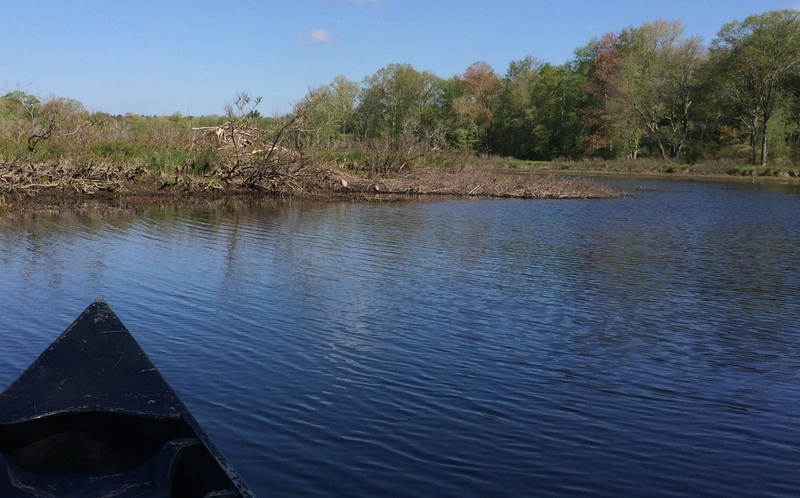 I’m not sure I’ll continue to write about canoe trips on this river, unless I encounter something new (or take Evie); but I did want to write this post to save these pictures and the sense of peaceful solitude that came from a few hours of escape. Canoeing is like hiking; I feel weak and strong and the same time, establish a sense of distance and perspective, feel proud and sad all at once. But most of all, when I’m out there, whether I’m powering my journey by foot or by paddles, I feel more like who I know I want to be. It’s that feeling that gets me through the next few days of business meetings and software design reviews. Because I know that something amazing is waiting for me, beyond the fluorescent lights and glowing computer monitors, if only I carve out a few hours and the physical exertion to experience it. The weather was incredible this weekend, and we had to choose from hiking or canoeing. 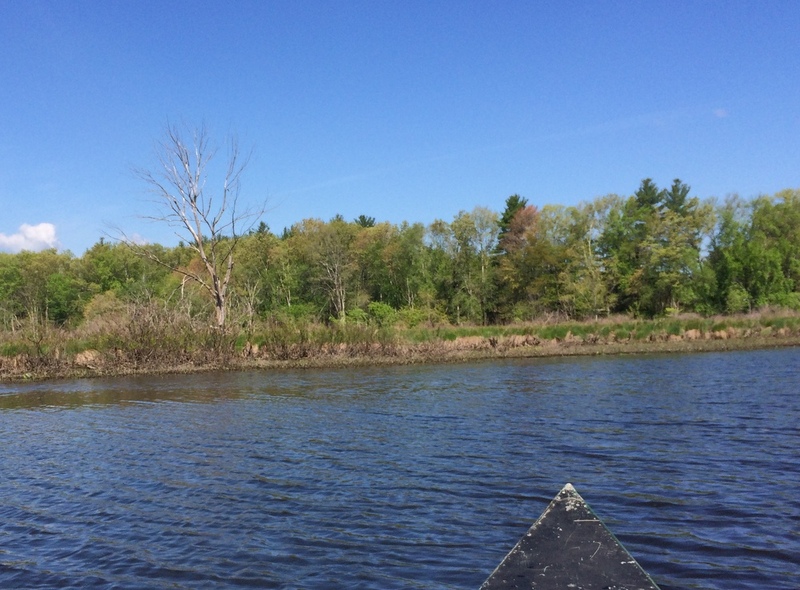 I hadn’t gotten Jess out on the water yet and so I pushed for a canoe trip. Fortunately, she was game. 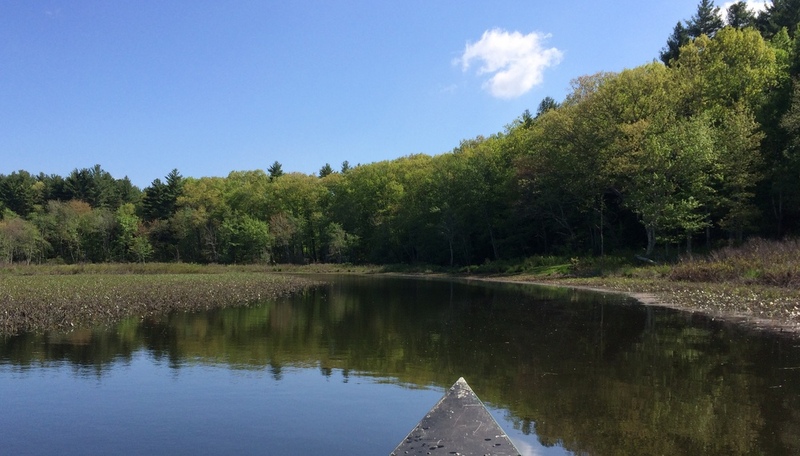 We decided to stay close to home and simple; we put in on Quaboag Pond, in Brookfield, less than a half mile from our house. Jess hadn’t been in a canoe since she was a child, so she was a bit nervous at first but it didn’t take long for her to realize how stable of a platform it was as long as the water was calm. 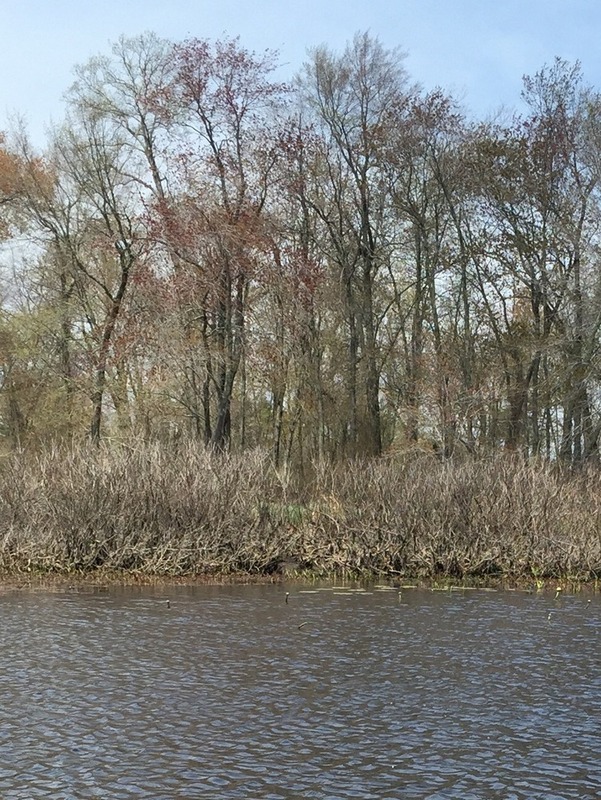 Our initial goal was to hug the shoreline of the pond and do a little fishing when opportunities arose. Though the air was fairly calm at our house, once we were on the water we encountered some pretty stiff breezes. 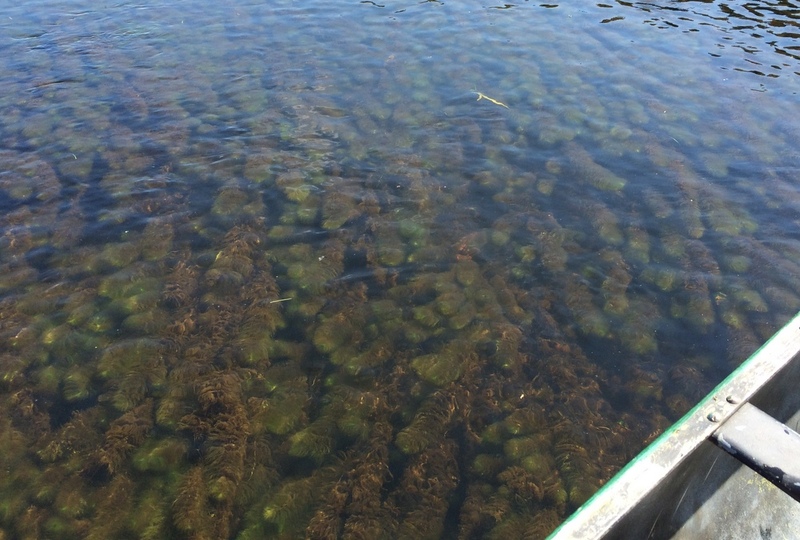 That, and given the wonderful weather, there were plenty of bass fishermen out along the shoreline as well, meaning that hugging the shoreline wasn’t possible, we had to keep diverting around the fishermen. When the wind would pick up, the boat felt a little less stable, and it was clear Jess wasn’t having as much fun as she hoped. So, we made a course correction, turned around, and went under the bridge and onto the slow-moving East Brookfield River. This river connects with the Sevenmile River in Spencer as well as Lake Lashaway. The air was calm once again, and we could paddle (or not) at our own pace. 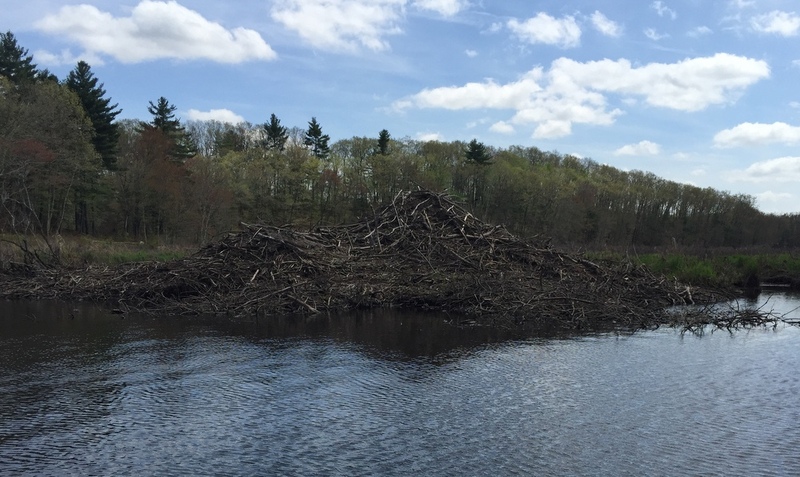 We admired several large beaver dens and listened to the many birds nesting in the area. Turtles would hop off logs and rocks as we approached. A huge hawk soared overhead, and sandpipers (we think) pecked at the marshy shoreline for food. It really was beautiful and calming; everything I want out of a canoe trip (except for catching fish, but you can’t have it all!). We saw several other kayakers but we all gave each other plenty of space. It was almost sad to turn around and head home, but our arms were tired and Evie was leaving gymnastics soon. We got a solid couple of hours of paddling in, though, and we know we’ll be back.